Occur naturally in desert oases in isolated areas of the Sonoran and Mojave deserts of southeastern California, southwestern Arizona, and northern Baja California, Mexico, at elevations between 500 and 1,000 feet. Widely cultivated as an ornamental in Southern California. Moist soils along alkaline streams and in mountain canyons. There are 2,500 species of palms worldwide, with 11 native to North America. The largest of these, and the only palm tree native to western North America, is the California fan palm. It is also known as the desert palm and the California Washingtonia. It should not be confused with the date palm. The fan palm has a large, gray unbranched trunk with horizontal lines and vertical fissures. The trunk is 2 to 3 feet in diameter and grows 20 to 60 feet high. The fan palm has numerous evergreen leaves, composed of leaf stalks, 3 to 5 feet long, with hooked spines along the edges. These fan-shaped leaves spread from around the top of the tree while numerous old, dead leaves hang down against the trunk. For this reason it is sometimes also called the petticoat palm. The dead leaves form a protective area that provides habitat and shelter for many creatures, including birds, insects and small rodents. In the spring, huge clusters of white, 3-lobed, funnel-shaped flowers, about 1/2 inch long, hang down from leaf bases. The California fan palm does not produce dates, but does fruit elliptical black "berries" about 1/2 inch in diameter. These berries have a very large, brown seed surrounded by a thin, sweet pulp, which native Americans ate fresh or dried. They also ground the seeds into flour. Hooded orioles and coyotes feast on the seeds as well, aiding the palms' proliferation. Rare groves of the fan palm can be seen in Anza-Borrego Desert State Park, near Palm Springs and Joshua Tree National Park in California, and near Yuma, Arizona. 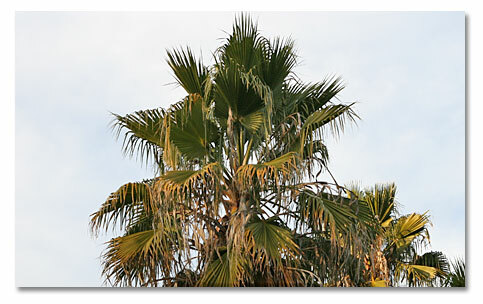 The California fan palm was an important resource for the Cahuilla Indians of Southern California, who called it maul. They used it for food, especially the fruit/nut which they ground up as flour or made into a mush. They also soaked the fruits to produce a sweet beverage and made jelly from the fruit. Trees produced a dozen or so such date clusters at 5-20 lbs. each. The spongy pith in the center was sometimes boiled and eaten and was called maul pasun or "heart of the palm." The fan palm was also used for construction (fronds for roof thatch), and leaves were stripped and used in various weaving applications. The hard seeds that fell after fruit pulp dried were the preferred fill for gourd rattles and were better than stones or other seeds. 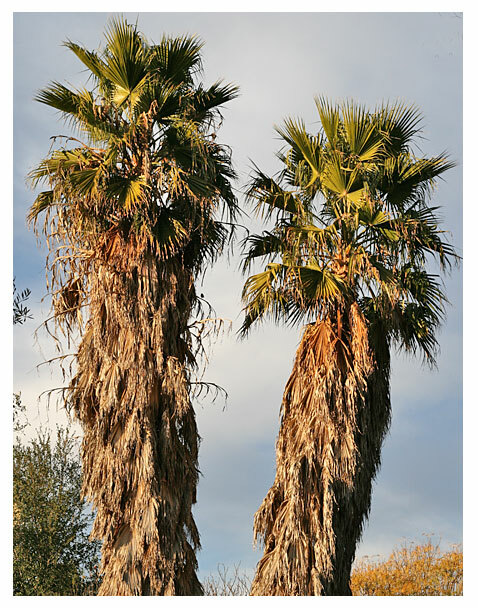 The Desert Cahuilla also preferred the fan palm for making sandals. Fire making tools as well as tinder were made from this palm. The original California fan palm oases were important gathering and habitation sites and were indicative of important springs, usually located along earthquake faults. Some of these included Thousand Palms, Palm Canyon and Andreas Canyon.